This past month I haven’t been blogging so much about each of the individual meals I have been making, although most meals have been photographed. So I thought I would do a little round-up of photos of the meals and a brief yea or nay vote on some of them. 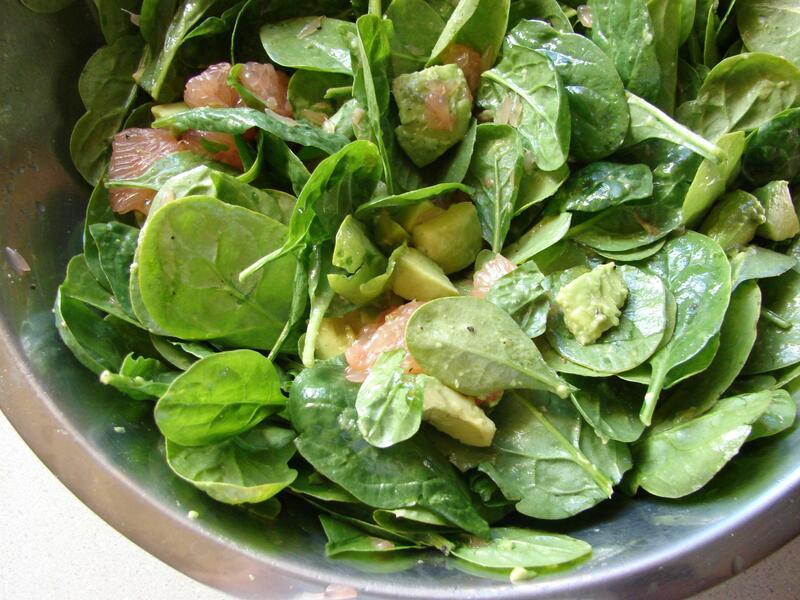 I enjoyed this salad, although my husband, who is not a big fan of spinach, did not. The oil in the avocado and then the tang of the grapefruit is all the dressing this needs. The leftovers even held up and made it into my lunch the next day. Yea for me. Instead of steak, we used tofu ‘steaks’. We also omitted the oyster sauce and added 1/2 Tbsp more of both the hoisin and soy sauces. We served this over rice vermicelli noodles which I had attempted to pan-fry. (They didn’t turn out so great.) The stir fry was delicious and next time I will serve it over rice instead of the noodles. The noodles didn’t have much flavor and actually detracted from the rest of the dish. Snow peas were fresh from our garden. Yea for us both. 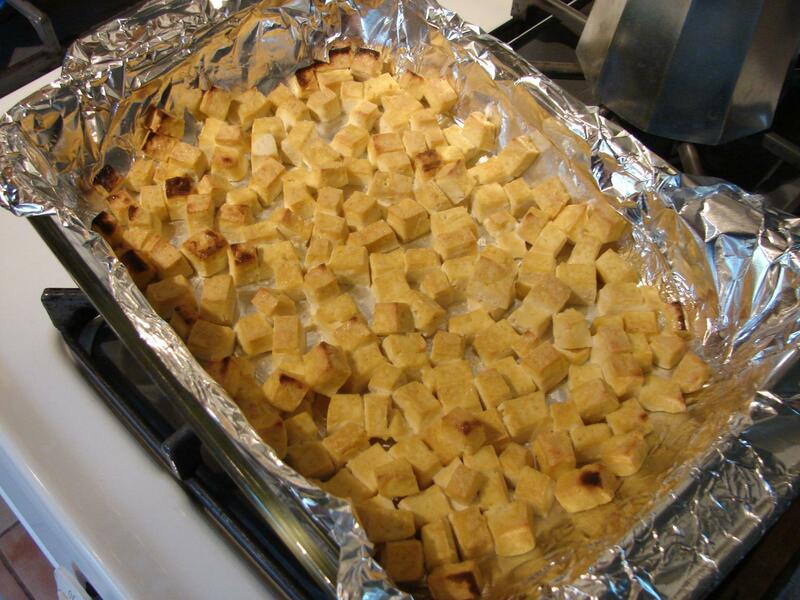 I baked the tofu in Book of Yum’s Yummy Grilled Tofu marinade. And the snow peas and carrots were sautéed in sesame oil with green onions. I baked my salmon with a red pepper/five spice powder rub and a rice vinegar/honey marinade. It was very tasty. Yea for us both. And yea for using up the rest of the snow peas we had from our garden this year. We’ve made this dish before and really enjoy it. We used canned, sliced water chestnuts instead of fresh ones. On the side we had some brown rice and steamed broccoli. I follow Susan’s recipe for the most part except I have found that we like a little more sauce in the final dish and so I double the marinade. Yea for us both. A couple weeks ago we ventured to the international market to get just a couple things. Uh-huh. As always we bought more than we went in for, but it was worth it! One of the items we bought was frozen lotus root. Whenever we see lotus root, my husband asks me to make him some just like ate in China. Since I haven’t tasted what he ate in China, I had to go looking for some ideas on what to do with it. My first stop was Book of Yum. 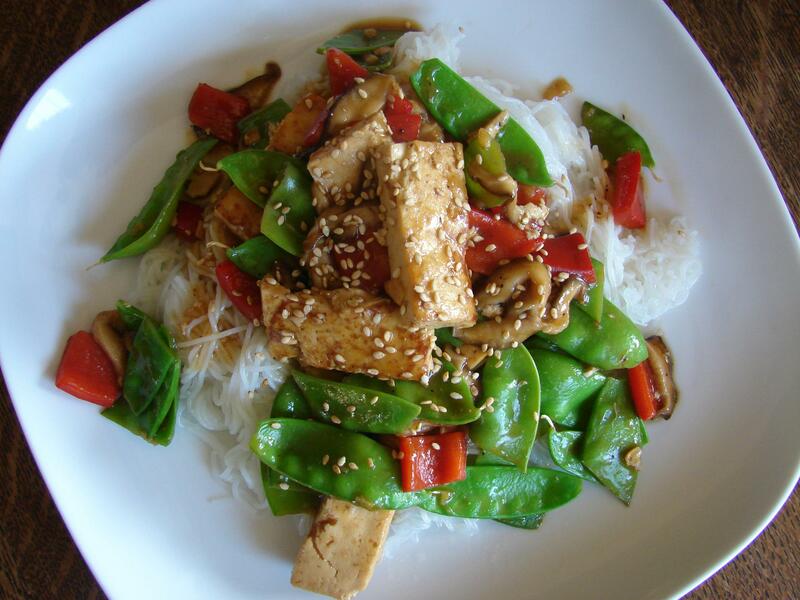 Sea always has great ethnic and vegetarian recipes on her blog. I found her recipe for Lotus Root Sesame Stir-Fry and decided it was the one to try. 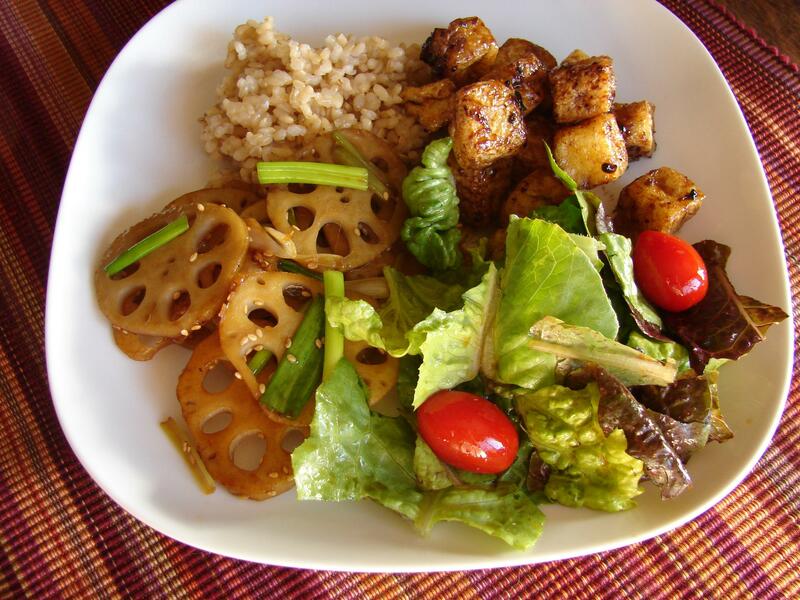 We had the lotus root with some brown rice, fried tofu and a small salad with a sesame-soy dressing. The whole meal got full approval from the hubby. Although he did say that he would like the lotus root to have more of a vinegar flavor. But he really likes vinegar. And all of his food memories of China involve vinegar. So next time we will have to try our own recipe – with vinegar! The lotus root that we bought was frozen. I thawed it slightly under cold water and then left it to drain and thaw in the colander for a bit. It was also pre-sliced and the slices seemed thick, about 3/8″, so I sliced each of them in half so that they would crisp up better. This seemed to work out well. We only used half of the bag of lotus root for this meal so I have been finding other ways to use it. I did make Sea’s Lotus Root Chips and they weren’t bad but I think I may not have baked them long enough or the slices were too thick; they didn’t crisp up as well as I thought they should. We may try again in the future. I did add them to a recent stir-fry and they were tasty in there. Our garden has been producing a lot of lettuce and we are trying to keep up with it, so I added a salad to this meal. Also to have a bit of green vegetables with our meal. I have been trying to make more of our own salad dressings lately so that we can better control the ingredients and the fat and sugar content. But most traditional vinaigrette recipes I find are the standard 3:1 ratio of oil to vinegar and this feels too heavy on the oil for me. So I have been playing around with less oil. I have found that I like to use a small (pint or less) glass Mason jar with a lid to make and store the dressing in, that way you can shake it up well when you are ready to use. But this time I only wanted to make a little bit of dressing, specific to this meal and didn’t want a lot of leftovers. Below is what I came up with. It swings wide from the traditional ratio but it was tasty and complemented the meal well. Mix all ingredients together in a glass jar or whisk in a small bowl. When most people think of grilling, they think of meat, poultry or fish. And I’ll admit that I do still like to eat grilled meat. Since I am the flexitarian and my husband is the vegetarian, we do periodically grill meat or poultry, for me. In fact, my vegetarian husband is quite good at grilling meat for me. And he has no problem making meat for me because we know that my body needs some meat from time to time and it is a good source of B12, which I have problems absorbing. Over the years we have grilled many things. 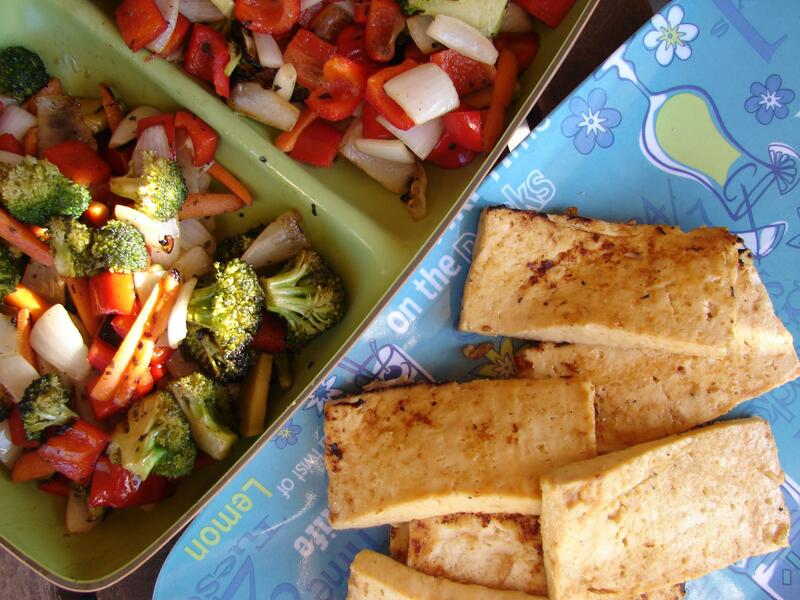 Some of our favorite things are grilled tofu, grilled mixed vegetables and corn on the cob. Recently we decided to break out the grill and start up the grilling season. 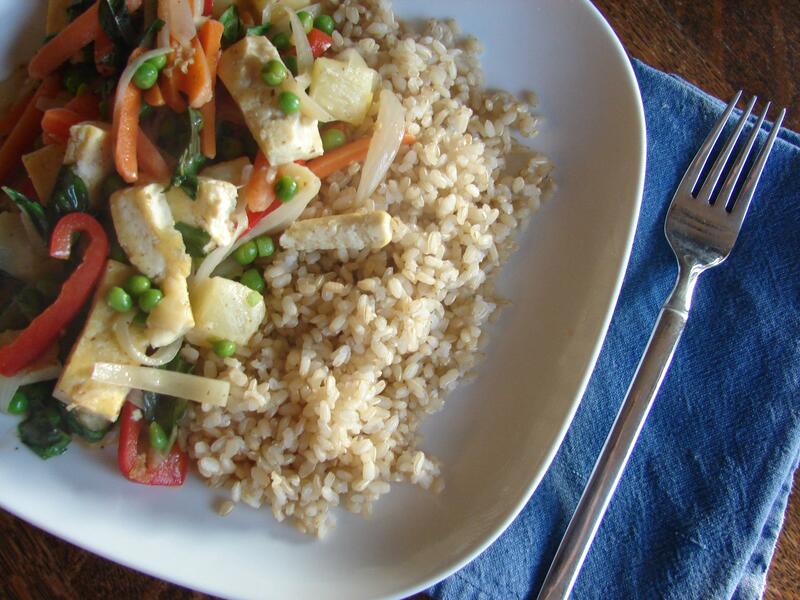 Right now we are on a kick of grilled tofu, using Sea’s recipe for Yummy Grilled Tofu. I will also make this marinade and use on chicken, also yummy! 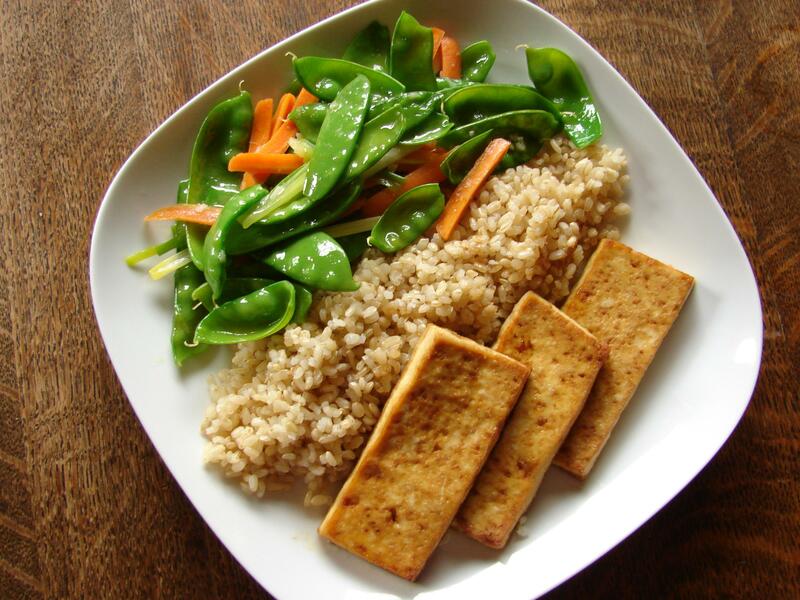 The best way to make it is to slice the tofu into large slabs, typically 8 slabs per 1 pound hunk of extra-firm tofu. I then press the slabs between a large folded tea towel for 15 minutes or more. The less water, the better, the more marinade it soaks up. 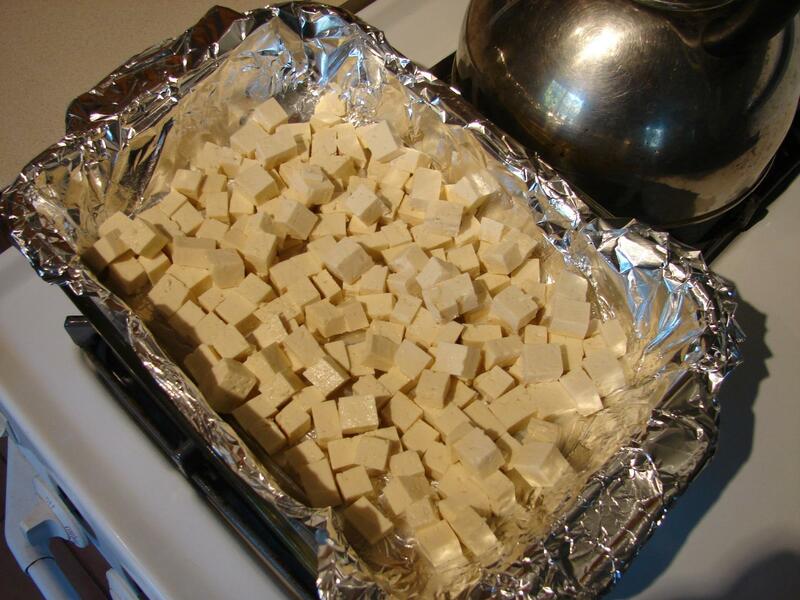 Then I marinade the tofu while I prep the other dishes. 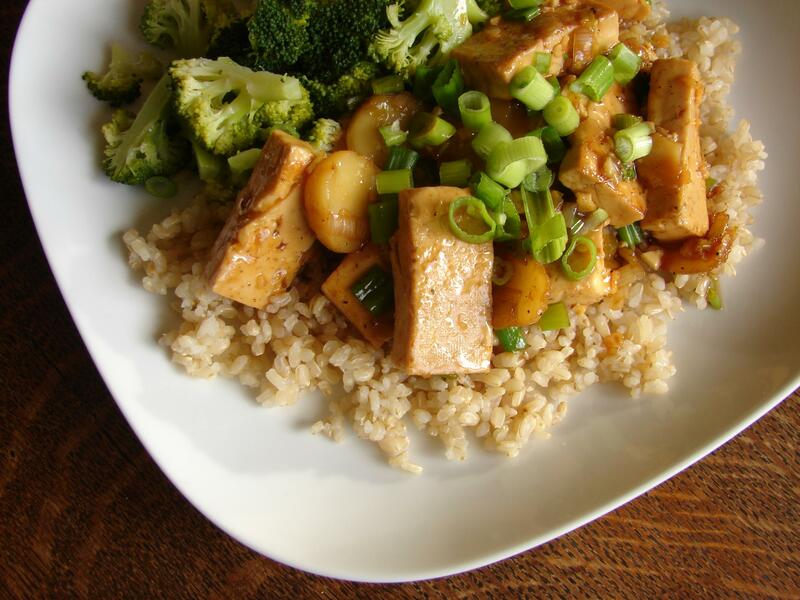 We also like this marinade recipe from Cooking Light magazine for tofu and chicken. 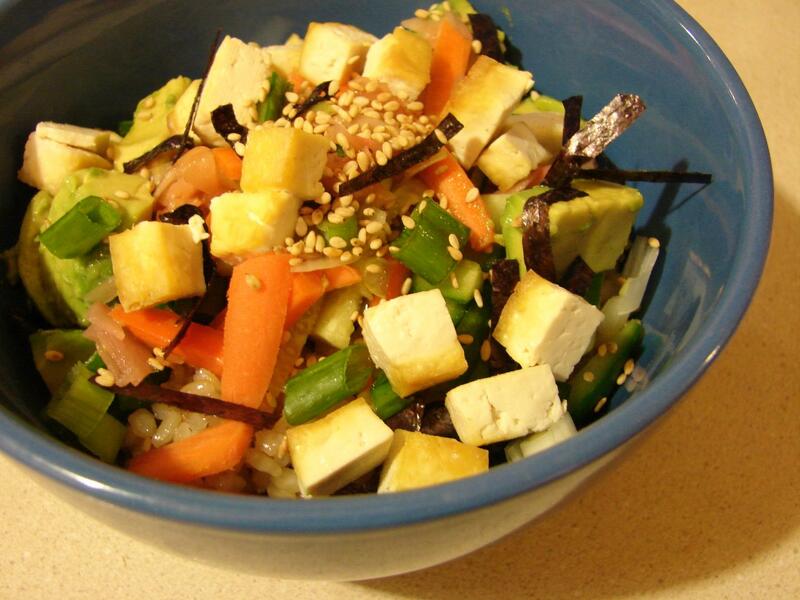 But if you are gluten free, just make sure you buy miso paste that is gluten free – some are made with barley. As for grilling the tofu, it helps to either grease the grill a bit, as the tofu sticks, or to grill it on a piece of foil. We often use a piece of foil to ‘protect’ my husband from the meat cooties if we have also grilled meat on the grill that day. We also like to make grilled mixed vegetables in a grill basket. Typically I chop up a lot of onion, slice baby carrots into thirds, chop up a red bell pepper and a head of broccoli and some of the stems and toss with some Italian salad dressing before it goes on the grill. We recently got a new grill basket from my mom, who sells Pampered Chef, and we like it a lot. We just wish it was bigger! This particular time we also made potato packets – something from my Girl Scouting days. Slice some potatoes and maybe some onions, green bell peppers and/or carrots. Place one serving on a piece of foil. Sprinkle with salt and pepper or whatever seasoning you’d like. Mrs. Dash, oregano, whatever. Put a small amount of butter on top and then wrap up the packets with an air-tight seal so that the potatoes will steam themselves. I also put about a tablespoon of water in the packet too, just before I fold up the last side. Sometimes we will just grill an entire sweet onion. Be sure to make more than one though as these are tasty. Clean and trim it and wrap it up in foil with some butter and stick it down in the coals. Delicious. Also great as part of a campfire meal. It isn’t corn season here yet, although I have seen it in the grocery stores. Growing up in the Midwest with grandparents who grew sweet corn, I was spoiled. And it just doesn’t feel right to eat corn before the end of July. Plus it is grocery store corn and I am a bit of a sweet corn snob. So no corn here for us yet. But when we do make it, we typically soak the ears in the husks in some water for about 20 – 30 minutes and then just put them directly on the grill. Make sure you turn them a few times so that they cook evenly. Pull back the hot husks, carefully, with oven mitts, and top with butter and salt. Or you can try other toppings like this one I saw over at Snack Girl this week. I might have to try this soon! We used to also grill Portobello mushrooms for my husband frequently – I am not a huge mushroom fan – but they have fallen out of favor lately, for no particular reason. He usually marinades them in garlic and balsamic vinegar. 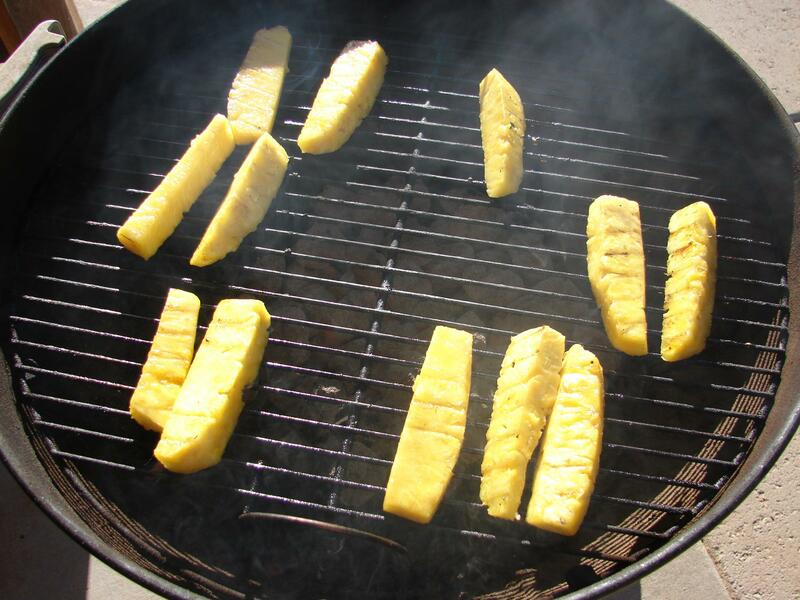 This last time, we grilled pineapple for the first time. Pineapples were on sale and my husband loves pineapple, so I grabbed one. I did coat them in a ‘marinade’, though they don’t really need it. I made the sauce out of brown sugar, lime juice, butter, cinnamon and salt. It was very good but I think we could do without the extra sugar and fat and next time we will grill them plain or with just a bit of lime and cinnamon. We really did enjoy the cinnamon flavor with the pineapple. What are your favorite vegetarian grill specials? We haven’t tried grilling gluten free pizza yet…have you? This message is linked up to Gluten Free Wednesdays where this week’s theme was burgers. No burgers here this week but instead we have other fun stuff to put on the grill! On the weekends, when I have some extra time, I will often tackle a new, time-consuming or difficult dish. Last weekend I tackled P.F. 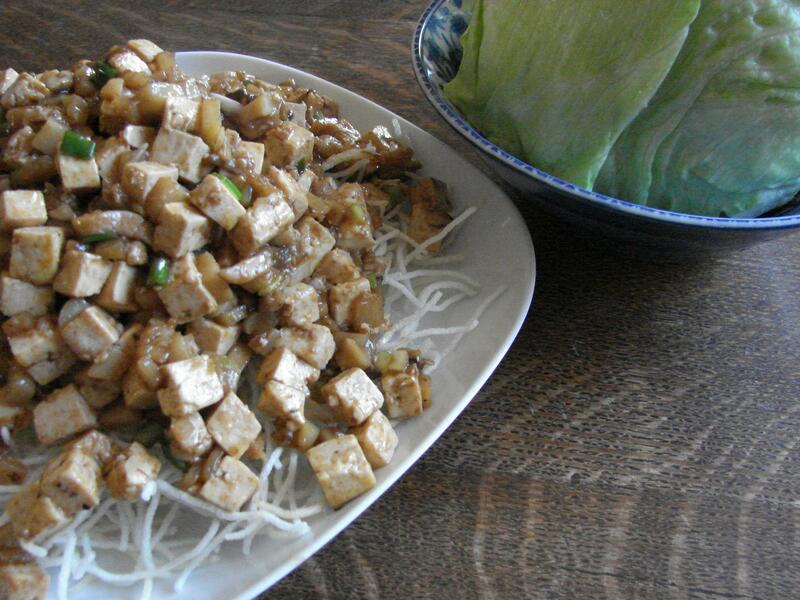 Chang’s Lettuce Wraps. Heidi of Adventures of a Gluten Free Mom found a copycat recipe and recently made them for her family. So I decided to try my hand at making them vegetarian. They turned out great! Be sure to check out the original recipe over at Heidi’s blog. I only made a few modifications. I used fresh shiitake instead of the dried as they are so easy to find at our local Trader Joe’s. And I used a one pound container of extra-firm tofu in place of the chicken. I sliced the tofu into 8 slabs and pressed them between clean dish towels to remove the excess water. Then I cut the slabs into cubes about 1/4 – 1/2″ in size. I did omit the oyster sauce as I have not been able to find a vegetarian oyster sauce that is also gluten free. Yes, they make vegetarian ‘oyster’ sauce – it is typically made from mushrooms – but we were unable to find one that was safe for both of us after looking at the international market, an Asian grocery and Whole Foods. If anyone knows of one that is gluten free AND vegetarian, please let me know. I am not sure there is one to be found. So, instead of the oyster sauce, I increased both the Hoisin and soy sauce to 2 tablespoons. Initially when I read the recipe I was concerned about the amount of oil used (5+ Tbsp) and so I started out using a lot less but found I needed to add more as I went along. I am not sure in the end whether I used less than called for or not. So, use your judgment and start with less if you want, but I think you will need to add more, just like I did. The rice noodles were a lot of fun, like Heidi says. The key is keeping your oil the correct temperature, and Heidi’s suggested temperature is right on. Initially my oil started getting too hot and the noodles were burning before I could get them out of the pan. When I brought the temperature back down, they were perfect and even if I couldn’t get all of the little guys out of the pan on the first scoop, they didn’t burn as quickly and I had a little leeway to chase loose noodles around the oil without them burning. Also, you don’t have to make very many noodles. I broke up a bunch of noodles in preparation for frying them and I ended up with a huge plate full, of which some were burnt, but I still had way too many. So our chickens got to enjoy the extras and the overly crispy, burnt ones. Just a note, if you are cooking for someone who requires a gluten free diet, be sure your ingredients are gluten free; in particular, the hoisin sauce, soy sauce and oyster sauce. This is a good starter recipe. The first time I made this recipe I modified it, which is unusual for me. You can check out the original recipe here. I think I change it slightly each time I make it. My modifications are included below. If you aren’t a fan of tofu, I am sure chicken would work just fine. Cut tofu into 8 slabs and press between the layers of a clean kitchen towel. Place a heavy pan on top and allow to sit for about 10 minutes, the longer the better. Prepare vegetables while tofu is draining. Cut each slab into 4 pieces. Heat the oil in a large skillet. Add tofu and sprinkle with salt. Cook about 5 minutes and then flip over and cook for about 5 minutes, or until it is slightly browned on the edges. Remove from pan. Add onions to skillet. Saute for about 5 minutes or until they are beginning to soften. Add carrots and bell pepper and saute for 3 minutes. Stir in curry powder and pepper. Cook for about 1 minute. Stir in coconut milk. Add peas and pineapple. Gently stir in tofu. Bring to a boil and reduce heat. Simmer for 5 minutes. Top with basil and serve with rice. 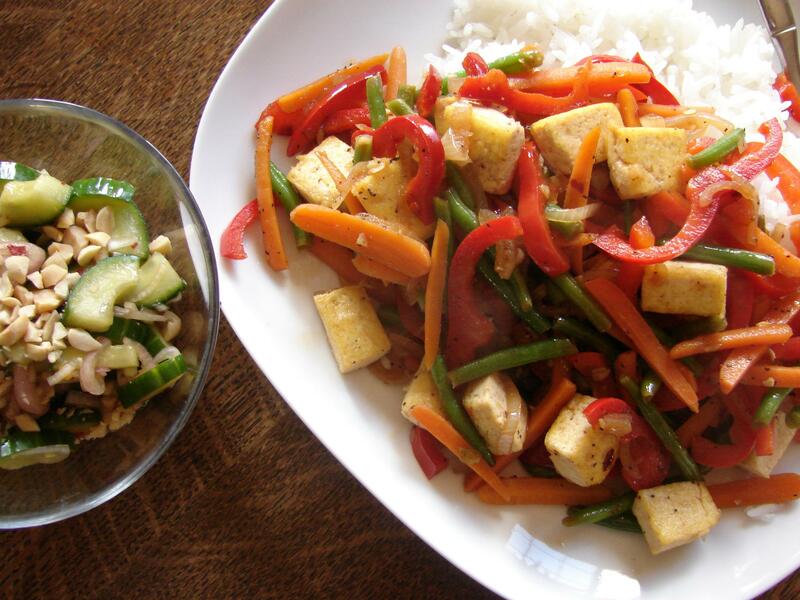 * Extra firm, water-packed tofu is best for stir-frying. You can find it at most large grocery stores. * I used a different curry powder this time, some Turkish curry powder that my mother-in-law brought me back from a trip. It is getting old and needs to be used. It wasn’t the best flavor for this dish. Next time I will go back to my regular old Spice Island curry powder for this one. * I prefer to use light coconut milk when I cook. Trader Joe’s has a house brand that works for me. * The original recipe does not call for onions or green peas but I like them both a lot so I add some every time. 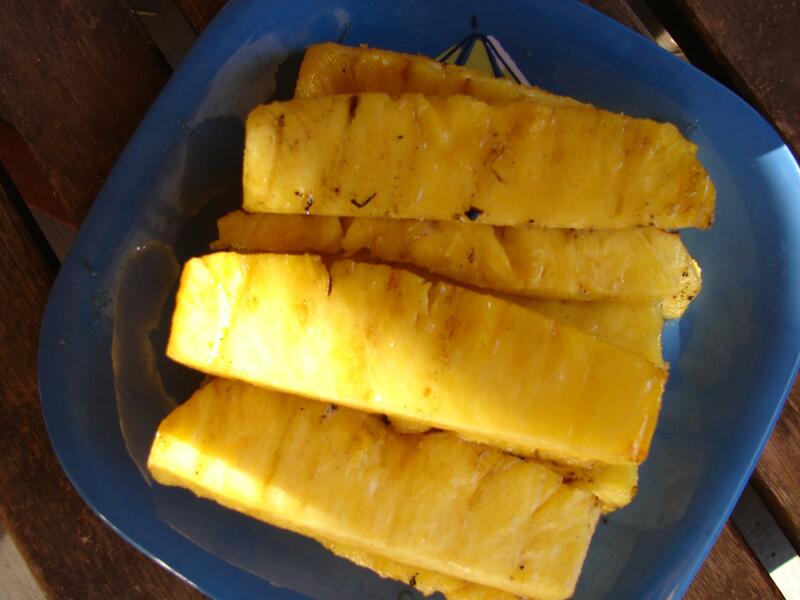 I am not a huge fan of the pineapple but yet add it every time. Next time I think I will try to remember to make it without. * I also used a whole can of coconut milk instead of just 1/3 cup. I wanted to be able to simmer the vegetables in the sauce a bit and 1/3 cup just isn’t enough.